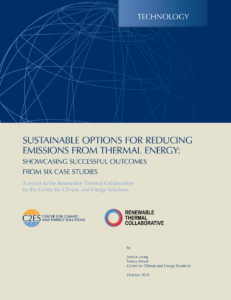 Today, in a report to the Renewable Thermal Collaborative (RTC), the Center for Climate and Energy Solutions (C2ES) published a series of six case studies illustrating renewable thermal technologies used by members of the Renewable Thermal Collaborative. The set of case studies represents a range of different solutions across an array of industries. They highlight different applications of renewable thermal technology from both inside and outside the United States—a consumer goods production plant using geothermal, a corn and starches facility using solid biomass, a cosmetics company using renewable natural gas from a landfill, an automotive assembly plant using waste-to-steam, and two wastewater treatment plants using biogas, one for a food processing facility and the other for a major city. Each case study provides details about the organization’s project and how it uses renewable thermal technology for their specific sector’s application. Unique financing strategies, project challenges, lessons learned are also shared from each project. Additionally, the RTC is hosting a webinar on the case studies on November 1st at 1 p.m. ET. Register now.